Funko just unveiled the new horror collection of their Savage World action figures, including Michael Myers and more of your favorite icons of terror. The Savage World line features figures in the bulked up, muscular barbarian style of the 1980s He-Man and the Masters of the Universe 5.5-inch action figures. 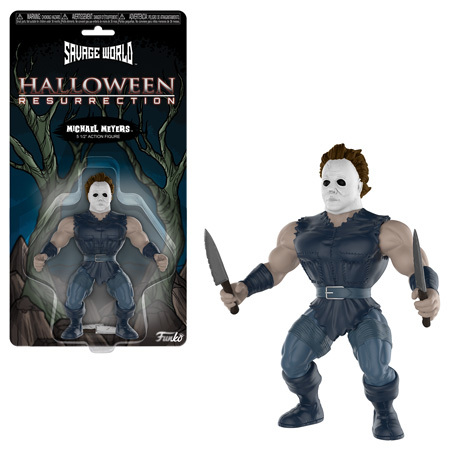 In addition to Halloween‘s Michael Myers, which in this case is oddly packaged as being from 2002’s Halloween: Resurrection, the new Savage World Horror lineup also includes Leatherface from The Texas Chain Saw Massacre, Jason Voorhees from Friday the 13th, Freddy Krueger from A Nightmare on Elm Street, and Pinhead from Hellraiser III: Hell on Earth. These figures will be released in January 2019, and you can pre-order yours from Entertainment Earth here.